In early March, the European University Association (EUA) published an extensive study on how nine universities across the continent cooperate with their regions and industry. Central European universities are behind those in western Europe in terms of the number of spin-offs; they also have a lower share of funding from industry. Europe as a whole lags behind the US and Asian countries in terms of innovation. In an interview for Universitas magazine, Thomas Jørgensen, Senior Policy Coordinator of the European University Association, discusses how and where collaboration and technology transfer can be affected and how university collaboration with regions must change. Rozhovor v češtině vyjde již brzy na Universitas.cz. 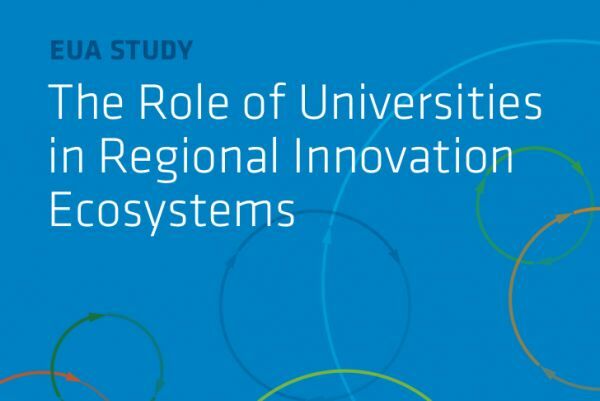 A study entitled "The Role of the University in Regional Innovation Ecosystems" was published in March 2019 by the European University Association. It presents a qualitative analysis of innovation processes in nine European regions. It compares nine universities of different levels and backgrounds, including some from the top 10% most competitive regions in the EU and some from regions whose GDP is below the EU average. The study included: Aalto University (Finland; ranked 191st in the world), Masaryk University (Czech Republic; 601-800), the Sorbonne (France; 73), the Technical University in Eindhoven (Netherlands; 167), the Technical University of Munich (Germany; 44), the University of Manchester (UK; 57), the University of Minho (Portugal; 601-800), UPC in Barcelona (Spain; 501-600), the University of Warsaw (Poland; 601-800). It focuses on the nature and quality of the relationship between universities on one hand, and society, businesses, government agencies and other public organizations on the other. Universities should no longer take as customers only companies which transfer the results of their research into practice, experts agreed at the 8 March launch of the new report. “They should create more strategic partnerships with companies much earlier,” says Jørgensen – not only in the natural sciences, but also in the social sciences and humanities. According to the study, today’s problems are interconnected and complex, and they require that many different stakeholders are engaged. In terms of university partnerships with companies, there is not enough innovation in Europe to attract investors to the market, too. The European Union is planning to set aside EUR 10 billion for developing new technologies and bringing them to the market through the European Innovation Council in 2021–2027. The new study emphasizes that a solid financial background is important too. “Universities with stable and strong resources with a low student-employee ratio are strong players,” adds Jørgensen. EUA is manager of a large study, which connects information from nine different regions all over Europe. Could you please explain why EUA is interested in these regions? We chose these examples because we wanted to have some good practices and show what can be done in different contexts in Europe. For example, Masaryk University is a context in central Europe, not in a metropolitan area (different from Warsaw, which is another central European case), and it has some good examples of investment in regional development. The study also has examples in the north and in the south, so it should give inspiration to the wide range of universities that EUA covers. You have chosen different types of universities. Why do you think it is possible (or necessary) to compare technical universities with “classical” ones, which often focus more on basic research than cooperation with industry or private companies? The study does have a lot of technical universities, but they very much do basic or ‘curiosity driven’ research [independent research the precise aim of which is not known in advance – Ed.]. Many interviewees in fact did not want to distinguish too much between basic and applied research; they felt that it did not make much sense. So this old classification no longer works? I think that it has more to do with the way that the university is able to function than with the disciplines it has – not least because everyone in the study emphasized interdisciplinarity. One example was an interviewee doing radio astronomy, which is very much curiosity driven, but because of the big data radio astronomers work with, much of what was done also developed artificial intelligence, which is then very applicable. Universities that have the autonomy to make strategic decisions about where they are going, have sufficient resources and are able to work as full partners with the rest of society are those that can really make a difference. Rather than seeking to provide rankings, the study wished to find different examples of what works and is good practice. Can you give an example of this? There are several examples of how you can have excellent research and education by working with external partners. In education, the problem-based learning was the one big success that interviewees pointed to, and we know that also from broader studies. When students learn in interdisciplinary teams to solve a challenge from the real world, they get exposure to other forms of knowledge – typically knowledge of digital skills, but not only that – and they can learn transversal skills from the teamwork. This is what happened for example in Eindhoven in what they call the ‘Innovation Space’. For research, Aalto University, for example had down-prioritised contract research for specific problem and focused on really long contracts where they looked for disruptive discoveries, based also on basic research. All this obviously requires that you have the autonomy to design new study programmes, and that you are not measured on patents and contract research, and of course that you are economically independent enough not to make contract research and get that income. The data show a remarkable difference between institutions in countries of western Europe on one hand and eastern Europe on the other. They have different positions, not only in terms of world rankings (in the THE World University Rankings, the universities in southern and eastern Europe included in the study are placed between 500 and 800, while institutions in western Europe are placed between 44 and 181) but also in terms of cooperation with industrial companies and in the field of technology transfer. According to the EUA Study, the Czech representative Masaryk University – the second largest university in the Czech Republic – has established only five spin-offs in the last five years, which is the least of all by some distance. What do these figures show? If you look at the overall figures for research and innovation, there are of course gaps, not only East/ West. One factor is the overall funding in the systems, and many of the central European countries have lower funding for universities and for research and innovation in general. Another factor is institutional autonomy. If you have very rigid accreditation systems and cannot design innovative study programmes, or you do not have the autonomy to choose the kind of researchers that will drive innovation, then things are more difficult than in cases where universities can do all of this. For Masaryk, there might have been few spin-offs, but there were a good number of start-ups, and it was a good case for developing digital skills. The EUA team has visited in person the institutions the study writes about. What was your impression of the Czech and Polish institutions? I ask this because this region is our readers’ primary focus. One could not say that there were ‘eastern’ examples and that these were essentially different from the rest, because the rest were also different among themselves. There is a commonality between Poland and the Czech Republic in that there were reforms in the systems that many liked. More freedom to make interdisciplinary study programmes was an example from the Czech Republic, more autonomy to make strategic decisions an example from Poland. These were good examples of how recent reforms were positive. What would you say is the most important thing for universities in Europe to focus on? Students were the big surprise in the study, particularly the way that they were often drivers of innovation activities. Moreover, the students were very engaged in working to find solutions to societal challenges and work for sustainable development within their region. Universities should really try to invest in their students and listen to what they have to say and give them the space to develop. What do you think of the opinion that teaching and research are what universities are basically about, and that they should stay unbiased, unpolitical and not too closely connected with private companies? I see no contradiction between concentrating on learning and research and working together with private companies. There were excellent examples in the study where you had student groups that are engaged in problem-based learning, and some of these problems come from companies. Also, there were examples of long-term contracts between universities and companies that focused on curiosity-driven research. Of course, universities also need a basis to do this without private contracts, and this means that they need stable core funding. There might be a problem where universities are being reduced to research laboratories for the private sector, because the strength of universities lies elsewhere. Generally, universities should be engaged in the society where they are, developing knowledge together with partners that are relevant, which can be NGOs, citizen groups, the private sector, or the public sector, as long as the outcomes are based on the integrity of research methods. Why is the role of universities in regional innovation ecosystems important? To put it briefly, universities give skills and competences to a large proportion of the citizens of the region. In Europe about half of young people are in higher education. Universities also provide life-long learning. They are places where curiosity-driven research happens, so in a knowledge society, unless you want always to do more of the same, you need a university. Moreover, universities are big institutions with resources, people and infrastructure. They are often the biggest regional employer as well. This means that if you want to really mobilize the resources of the region, you cannot ignore universities. Are there any questions connected with the subject of the study that remain unanswered? The study does not give definite answers. It is meant more as an inspiration for others. I think that we do need to think about some of the questions raised, though. Particularly how we can escape from the logic that university innovation is all about patents and contracts with private companies. We need to talk more about how university innovation provides solutions to the challenges we face – climate, health, mobility etc. Could you explain what represents success in “regional innovation ecosystems”? Systems are successful when they achieve the goals that the regions have set themselves. If a region is going through an economic crisis, and it uses innovation to reinvent itself (this was the case in many of the examples), it is successful. However, regions should not just be content with where they are. Some of the regions that had been economically successful were now setting goals for being more sustainable overall, and then you have a new goal to reach in order to be successful.